One of the neatest things about being onboard the JR is learning lots of new things. I also find out that I’m re-learning stuff I knew in school but had forgotten. In the last couple of days, I’ve been able to spend some time helping the scientists and technicians with their work. There is so much going on at any given moment. You can stand and turn in a circle and see 10 different things happening. I’ve gotten to help on the catwalk a little bit with cutting the core and sealing the tubes. 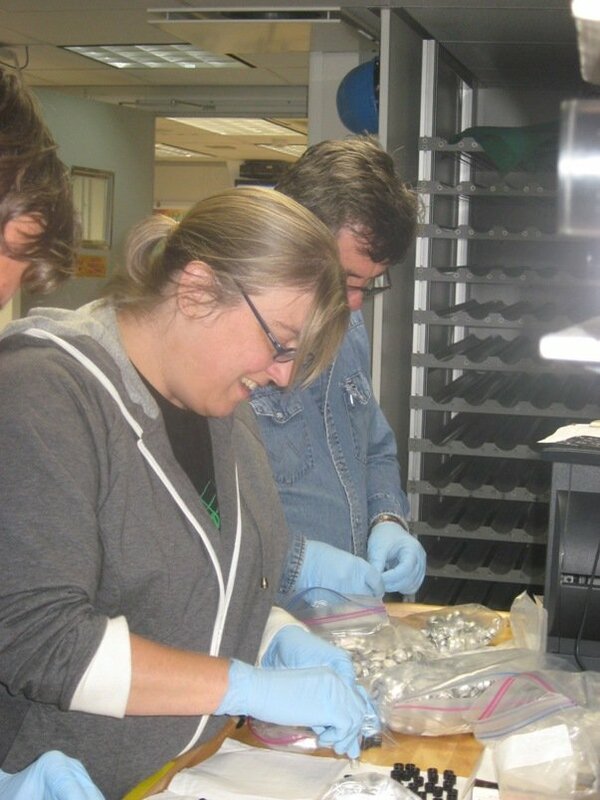 I’ve been helping the scientists who are taking the samples by helping them bag, label and seal the samples. I helped prep bottles to be used in the geochemistry lab. I learned how to make a nannofossil smear slide. I’ve also been promised a shot at washing sediment for the paleontologists too. I’ve also learned how finicky vaccuum powered toilets are, that the top bunk is not as much fun when you’re a grown up, and that I like swordfish, but don’t like papaya. One thing I really want my students (and anyone else for that matter) to take away from my time is here is that learning is not an event, it’s a process. You don’t walk off the stage at graduation and say "Whew–no more learning for me!". We should work hard to make sure we never stop learning, because I feel if you stop learning, you stop growing as a person. When that happens, you can’t reach the full potential of who you are meant to be. So – here is my challenge for you. I challenge everyone who reads this to think of one thing they want to know and go find out the answer. It doesen’t have to be science, it could be the name of your favorite flower, or what kind of tree is that you pass every day on the way to school. I challenge you to learn one new thing every day!